The long nightmare is over. Metro has hired a new general manager. Metro’s year-long search for a general manager ended Thursday with the selection of a former top Maryland transportation official whose combination of financial and operational experience in public transit won him unanimous support from the agency’s sometimes-fractious board. Paul J. Wiedefeld, a former head of the Maryland Transit Administration and Baltimore-Washington International Marshall Airport, has agreed to become Metro’s top manager and will be officially hired Nov. 19, the transit agency announced. 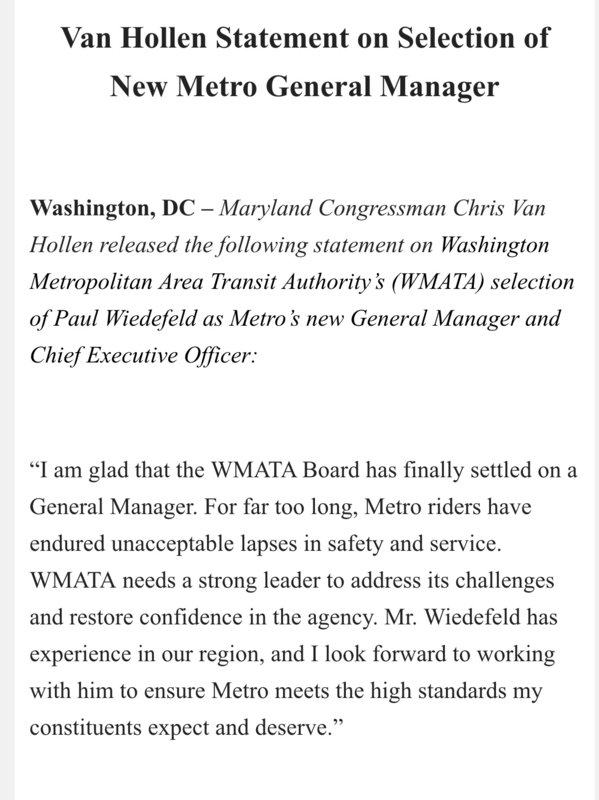 Chris Van Hollen issued a statement this evening on the hiring. I’m trying to understand how something so fundamental can take years to be recognized. Metro has a report out acknowledging that its reliability issues might be driving commuters out of using Metro (yes, yes, pun intended). What’s next? Snow is cold? Rain is wet? Sun is hot? Metro, in an unusual acknowledgment, says breakdowns and other service failures appear to be contributing to a steady, years-long decline in ridership that is causing financial stress for the transit agency and could lead to fare increases. The persistent drop in annual rail ridership since 2010 results not only from economic and lifestyle changes in the Washington region, according to a Metro budget report made public this week. The report cites “preliminary evidence” that “concern by customers over service quality and reliability” also is taking a toll on ridership. The document — prepared as a revenue briefing to be presented to members of Metro’s governing board Thursday — includes an uncommonly candid recognition by the agency that subway performance woes have become so chronic that more and more commuters are abandoning the system, which has worsened Metro’s money problems. When I came to DC in 1981 (yes, the year Reagan was inaugurated), Metro was barely five years old, the Red Line stopped at Dupont Circle, the Orange Line at Ballston, and the Blue Line at National Airport (where the unionized air traffic controllers still worked and the name of the airport hadn’t been hijacked yet). Metro was gorgeous. The trains were pretty and clean, they ran on time, and the stations were lovely in a minimalist, Blade Runner sort of way. Everyone wanted to ride it. But 34 years of wear, tear and neglect of basic maintenance by all involved jurisdictions has brought us to the point where nobody wants to use it. Most recently, in 2011 and 2012, my family and I (including a very sick wife) were left waiting for trains for between 45 minutes and an hour outside in the cold at New York Avenue on three separate occasions, the only times we tried to use it. I won’t use it any more because I can’t rely on it to any meaningful degree. I’d like to but I can’t trust it. The fact that Metro is only now coming to grips with the idea that its maintenance problems and lack of reliability are costing it money is kind of shocking. I know commuters who stopped using it five, 10, 15 years ago. Hello? I don’t know if we can fix it at this point. The investments required are massive but the long term failure to understand the breach of trust that was going on is worse. It’s sad, because the system was once the envy of the country and the world, and we let it fall apart right before our eyes. I think about Metro a lot when I end up in discussions about the Purple Line now. It’s coming right through my civic association neighborhood, right down Wayne Avenue. When I see the state investment being lowered, and I see corners being cut right off the bat, before we even begin, and I read about the impact on the local residents, I think “are we just dooming ourselves to the same outcome?” It’ll be pretty, and people will use it for a while, and then it’ll fall apart because we haven’t invested sufficiently in maintenance and upkeep, and then we’ll be told that public transit doesn’t work and the neighborhood impacts and dislocations here in Silver Spring will have been for nothing, and I think surely there’s a better way but nobody is listening and I think about history repeating itself first as farce and then as tragedy and then I realize that I’m talking to myself in the park again and I really need to stop doing that. You get the idea. What I’m asking is this: Isn’t there a better way? Four years late and $50 million over budget, Montgomery County this week will turn over control of the Silver Spring Transit Center to Metro. Metro plans to accept the Silver Spring Transit Center from Montgomery County as early as this week, and has set a Sept. 20 opening date for the problem-plagued facility. Montgomery County on Thursday sent Metro a letter of transfer, detailing the completion of the three-level commuter hub that was plagued by cracks and other construction and design flaws. Metro said that it has 10 days to formally accept the facility, but it doesn’t expect any outstanding issues. Let’s not forget, of course, the recent transparent bluff by Metro in an effort to extort money and other concessions from the County. That will be a comedy-packed moment in the screenplay of this agonizing saga that is sure to be a huge hit with absolutely nobody. Short version: Metro bluffed, MoCo called . . . and Metro folded like a cheap suit. Well played. A spokesman for Montgomery County executive Isiah Leggett said Metro has dropped its demand that the county –which oversaw the problem-plagued construction of the facility–provide an extra $15 million to cover future maintenance and repair costs. The transit agency’s demand was one of several conditions it set last month for accepting the building from the county and incorporating it as a hub for its bus and train system. And while Metro spokesperson Sherri Ly would not confirm the agency’s revised position, she said interim general manager Jack Requa will ask the Metro Board on Thursday to give him the authority to formally accept the transit center from the county. “We will announce an opening date as soon as we are able to do so,” Ly said. Metro needs a refresher course on poker. Maybe something from the Doyle Brunson library? As further details emerge about the dispute between Montgomery County and Metro, the more it becomes clear that Metro’s demands to the County are both ham-handed and almost comically absurd. The Post article today notes, among other things, that it’s not clear that different Metro officials actually know what the rest of the agency is doing. So between June and September, there are no meetings of the Metro board? And nobody thought of this while they were focused on an August 23 opening date? Brilliant. Wow. The request for a $15 million escrow fund was not unreasonable, in my view. But asking the County to give up its 25% interest in development rights around the station was preposterous and not related to the problems with the transit center. And demanding the County provide a 100% tax abatement on any development for ten years brought the Metro effort into the realm of the criminal shakedown. A clumsy, ill-conceived plot worthy of a bad organized crime screenplay. And it’s stupid. Metro has been underfunded for years, as a result of the inaction of the three states that, with the federal government, pay for Metro. There’s never been a dedicated Metro funding stream in Maryland. The agency was on the moral high ground to at least some degree in this matter. At least in MoCo, that ground was thrown away in what appears to be an 11th hour hare-brained scheme to shake down the county over the transit center, after months of cooperation toward a mutually-agreed opening date. Dumb, dumb, dumb. Metro Jacking Up MoCo Over Transit Center? Metro has told Montgomery County officials that some of the recent repairs to the Silver Spring Transit Center are showing “signs of degradation,” and it is asking the county for $15 million to cover future maintenance and repair. County officials, in turn, accuse Metro of attempting to hold “hostage” the delivery of the problem-plagued facility to the transit agency until its demands are met. The new round of charge-and-countercharge is the latest in a long history of interagency discord surrounding the three-level commuter hub, which is four years late and $50 million over budget because of design and construction issues. There’s more – go read it. Should be an interesting stare down over the next few days. Expect lots of mean words to be flung about by both sides.